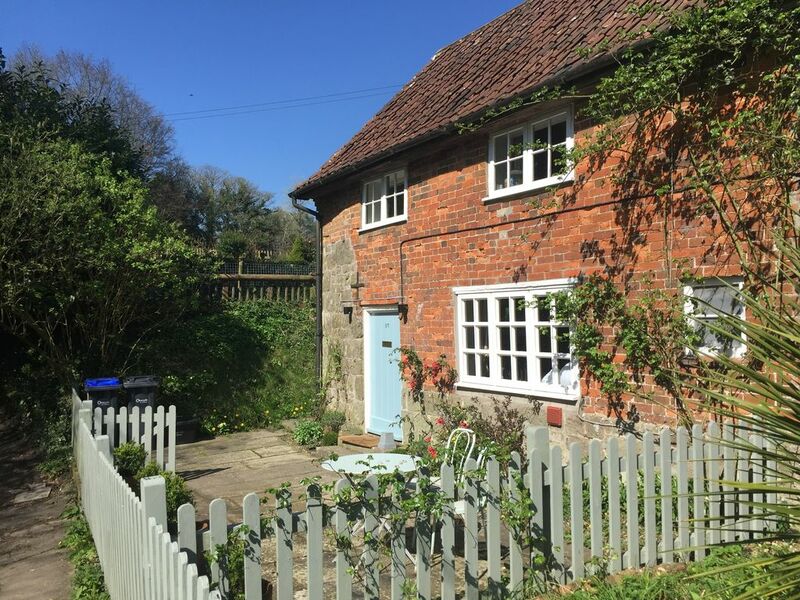 Wise Cottage is a 250 year old cottage with a boutique feel and sweeping views over fields, situated in a beautiful village near Shaftesbury, Dorset. A few yards from the shop is an excellent playground and our award winning village shop. The cottage has been furnished with antiques, carefully chosen pieces from our travels abroad, soft rugs and comfortable furniture to make a stay as wonderful as possible. The cottage is close to Longleat, Stone Henge, the Georgian City of Bath and the beautiful Dorset coast. (We are happy to accept well behaved dogs). The cottage sleeps four comfortably and five cozily, 2 bedrooms, 1 large master bedroom with a super kingsize bed and a small bedroom with adult bunks. A guest bed can be put up in the main bedroom or the sitting room for a fifth guest (there is not room in the bunk room for the extra bed). The cottage includes a wood burner, super fast Wifi and garden. There is a large sitting room with oak dining table and contemporary chairs, a well fitted kitchen with washing machine, dishwasher and fridge/freezer. The main bedroom has an upholstered Super kingsize bed with high quality Vi Spring mattress, high quality microfibre duvets and bed linens. The second bedroom has full size bunk beds. Polished wooden floors, Roger Oates runners, sisal flooring and oak floorboards. The bathroom has a pressurised shower and bath. There are plenty of towels provided as well as a wonderful organic bath and body range. The bathroom is situated downstairs opposite the kitchen. The garden is situated up steps from the cottage, it is probably not easily accessed by anyone disabled or infirm. It is a cottage garden, not highly manicured but with wonderful views in every direction. A table and chairs and a barbecue and tongs are also provided. There is a side access to the garden and it is fenced, so will contain a not overly ambitious dog. The cottage has a Samsung 32" smart TV, super fast broad band, a small office with desk. Mobile reception is good, but patchy in the downstairs rooms. There is a wood burner and logs (extra logs can be supplied for a further price), iPod dock, Roberts radio, smart TV, fluffy towels, high quality linen, bathrobes, high quality bath and body range of products. The kitchen is fully equipped with all china and cutlery, pans, casserole dishes, salad bowls, a Nespresso coffee maker (with coffee capsules!) and there is a supply of tea bags, coffee, sugar, olive oil and salt and pepper to start you off. We always leave a welcome pack such as fresh local bread, home made jam, butter and milk. There is complimentary use of our local tennis club - please bring your own racquets and balls. Hi! We are Vanessa and Bruce and we have two children. We live in the most stunning part of the English countryside, on the border of Wiltshire and Dorset. The area is typified by tight valleys, rolling hills and huge views. We moved here from London 10 years ago to bring up our family. Vanessa organises African safaris and Bruce is a motor racing journalist. We have a huge appetite for foreign travel and love interiors - hence our addiction of making the cottage the most idyllic and inspirational place to stay! We bought Wise Cottage in March 2016 as a holiday let. It's origins date back probably about 300 years, it is typical of the small cottages found in this area, originally a tied cottage to the large estate in the village. The views from the cottage are gorgeous, the cottage space is charming and cozy and we just knew it would be a perfect place for rural holidays. The location means that one is within easy reach of numerous places, the Georgian city of Bath, Stone Henge, Longleat (the finest Elizabethan house in England), the Dorset coast line, Lyme Regis, Roman hill forts, beautiful market towns and London is still only two hours away. Walks from the cottage are beautiful. The bathroom has an over bath shower, heated towel rail, fluffy bathmat and towels and high quality organic bath and body product range. Efficient wood burning stove for cooler evenings, wood, kindling and firelights are provided. The kitchen is very well fitted out, with washer/dryer, dishwasher, electric oven and hob and all cooking pans and trays necessary for any style of cooking. High quality crockery and cutlery. Lovely and well appointed. Certainly recommended for a getaway. What a lovely little cottage, in a glorious part of the Southwest. Hosts Vanessa and Bruce are helpful and charming. Spaces are small (but perfectly formed). We would’ve loved to stay longer! This is a lovely little cottage and is well appointed and comfortable. It was a little chilly when we arrived but the log burner soon raised the temperature although we did get through quite a few logs over the weekend (typical bank holiday weather!). Vanessa was very helpful and we recommend this cottage if you're seeking a little rural charm. many thanks for your lovely review Adrian, so glad you enjoyed it and only wish the weather had been better! A great little property and perfect for a getaway. Very comfortable cottage. Very friendly and helpful owner. Sympathetic restoration and updating of a workers' cottage. Beds are warm and comfy. The people in the village are very welcoming. Schönes Cottage mit Garten und Pool! Schönes kleines Cottage mit Garten. Den Pool haben die Kinder sehr genossen. Idealer Ausgangsort für viele Ausflüge in der Nähe (Shaftesbury, Stonehenge und Longleat House sind sehr nah, aber auch Highclere Castle oder Durdle Door an der Jurrasic Coast sind gut zu erreichen). Das Pub Fox and Hounds haben wir mehrmals besucht. Alle waren sehr freundlich. Wir können das Cottage empfehlen! Thank you for your lovely review and for coming to stay. Thank you so much for your lovely review Titus. We very much hope you are able to return later this year perhaps. The area near Shaftesbury on the Wiltshire/Dorset border is one of the most beautiful areas in the country. The village of East Knoyle, birth place of Sir Christopher Wren, is charming. There is an excellent community run village shop (less than 100 yards from your door and often compared to a mini Fortnums! ), a convivial pub serving excellent food, a well equipped playground with football pitch (again less than 100 yards from the cottage), and endless walks through woods and fields. Frome Independent Market -a fabulous food fair which is staged the first Sunday of each month. In the summer there are many National Garden Scheme gardens to visit and village fetes are to be found nearly every weekend.